What my blog is about today is this beautiful apple crumble cake. It is so soft and yummy. The basic recipe is really simple. You basically just slice up the apples, then sprinkle the crumble topping over it and bake it in the oven. One of my friends once made. I’ve never actually made an Apple Crumble before.First Time I tried...I had taken recipe from here.I served with home made vanilla Ice cream. Core and peel apples...chop into small pieces. Toss these with lemon juice immediately after all have been chopped or they turn brown. Put the apple slices into the casserole dish. If you are adding the optional cinnamon, do it now. Make sure it is sprinkled evenly throughout the apples. Sprinkle the remaining of sugar evenly over the apples. Mix the butter / margarine,sugar with the flour in a dry bowl using a fork until you have a texture like breadcrumbs. It's not important that every single bit is like breadcrumbs, but try and get most of it like that. This will take about three minutes. If you are adding the optional ingredients of oatmeal or Corn Flakes, do it now. Mix it all in well. Toss this well with the raisins , sugar , cinnamon. Now toss in the oats lightly with a spoon Now, evenly spread the 'crumble' mixture over the sugared apples .covering the whole thing well up to the edges. Press down lightly. Put this into the middle of your pre-heated oven at 180C . Bake at 180deg pre-heated oven till top light brown and stewed apple juice begins to appear on edges. When the crumble is cooked, leave it to cool for at least 15 minutes. Serve hot or cold with either a dollop of whipped cream, or vanilla ice-cream. The ingredients below will make a medium sized apple crumble, enough for four people. Malar Gandhi of Kitchen Tantra was very disappointed to discover about her copied content and Images. Chef srividya76 from www.ifood.tv has posted many of Malar’s recipes along with the photos. This is so exasperating. These blogs were created to share one own’s ideas and interests. If a person wanted to try out anything from a blog, all he/she has to do is to just ask. Please go through Malar’s blog and have a look at the posts that have been copied by this person. I request all the blogger 's to come together and raise there voice this disgraceful act. Plagiarism is a very petty and cheap act and it's high time we all stand up against it and take measures to make our blogs as anti-plagiarist as possible. So good for the first time.....Lovely.Home made ice-cream wow! Will surely taste delicious. Thank you. Thanks for the support and standing by me, dear. I will never forget your gesture. The way you posted a whole article about plagiarism.....hat's off, thank you so much sweet heart. Btn apple crumble sounds very interesting......nice one dude. I should try this. its diffrnt and must sounds taste. 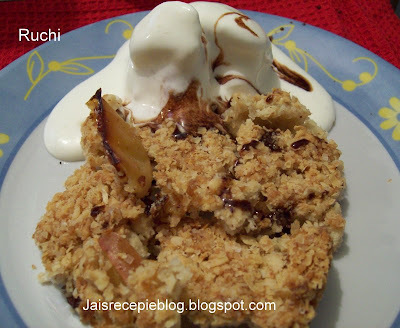 Apple crumble is my favorite and I enjoy it when its hot along with cold ice cream.. Looks absolutely scrumptious!